This section aims to help you consider the impact the death of a client has on you, colleagues and other clients. It also aims to support your understanding of the nature of grief and loss, and outlines how to manage emotional and practical issues after a client dies. For many clients, issues may exist that are likely to make them more susceptible to experiencing difficulties during bereavement, with some being more at risk than others. This is often as a result of prior experiences of multiple losses and trauma in their lives. Furthermore, some research suggests that the death of people experiencing homelessness are more likely to be sudden and traumatic than the deaths of people who are housed. Such sudden or traumatic deaths can further intensify the grief reactions of others, particularly those close to the client who died. Currently, in order to access most bereavement services, a person is required to agree to attend a number of sessions, refrain from drugs or alcohol during the sessions and be open to talking about their loss. This may be difficult for some people, probably those most in need of accessing bereavement support. Grief is a natural process that takes time, and not every client will require formal bereavement support. However, if you are concerned about how a client is coping, at any stage before or after a loss, involve the client’s GP and/or members of the multi-agency team, as the client may benefit from more formal support. This may come from the GP, any psychologically based services if available, or from your local bereavement service. Consider nominating staff members to ensure clients receive support over the days and short weeks after a death. This can provide a space for people to talk about their emotions and may help reduce the impact of the loss. As a team you need permission to grieve, to be able to show and express emotions, and to be able to take care of your own needs in a way that is appropriate to you. Consider what is needed to support all members of the team, particularly in the initial days and weeks following a death. What actions might assist you and your team? Include opportunities for reflective practice, or counselling, and activities such as a shared meal. Consider as a team how you want to acknowledge a death. This will also help to validate the importance of everyone’s life. Always involve clients in the planning of celebrations. Some clients may also have chosen to tell someone about the kind of celebration they would like once they are gone. Celebrations of life are often times when people reflect on their own wishes. This may be a good opportunity to explore with clients what these wishes may be. There are some practical issues to consider following a death, which are considered throughout this section. The bereavement support activity sheet, and the “after a client has died” flowchart can help you here. Depending on the nature and cause of death, a coroner’s investigation may take place before a funeral can be arranged. If there is no next of kin, or means to pay for the funeral, a public health funeral can be arranged. Many bereavement services have already begun to create initiatives to support people experiencing homelessness. Get in touch with your local bereavement service, invite them to your project, and explore together how they can support you and your clients. This can also enable them to understand more about the clients you work with, and how to overcome some of the challenges some clients experience in accessing bereavement support. It’s possible they may agree to provide support at the project. The Cruse Bereavement Care website can help you find a bereavement service nearest to your project or service. Bereavement is the term used to describe the situation we find ourselves in when we have lost someone. Grief is the physical, emotional, social, spiritual and cognitive reaction to bereavement that often involves strong painful feelings and emotions. 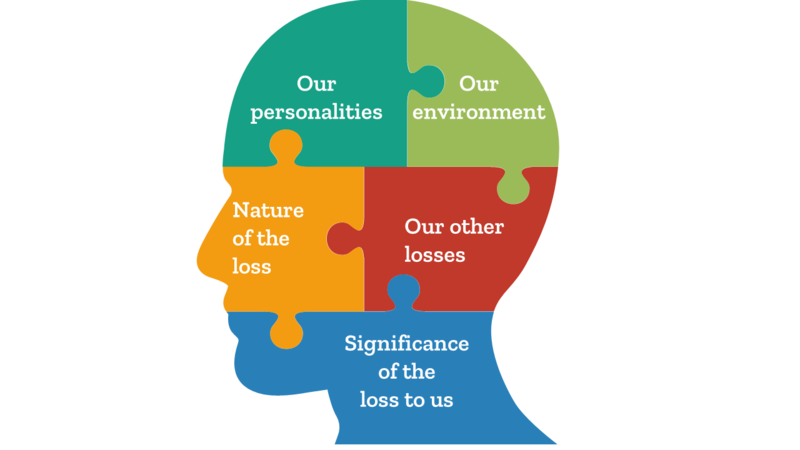 The sense of loss can be a personal and highly individual experience, and can influence the type and level of support we might need. Mourning describes the culturally-patterned expression of grief or the rituals surrounding a death or significant loss. How we grieve can vary greatly from person to person. However, what we know is that grief itself is a natural process that takes a different length of time for each of us. It is perfectly normal to find the first year following a significant loss difficult, particularly as we face significant events, such as birthdays and anniversaries. Nor is it unusual for it to take some weeks or months before we can actually begin to talk to others about what has happened. Our emotional and physical reactions can also be impacted by the different types of grief we can experience. This includes the grief we feel following a sudden or traumatic death, anticipatory grief or complicated grief. 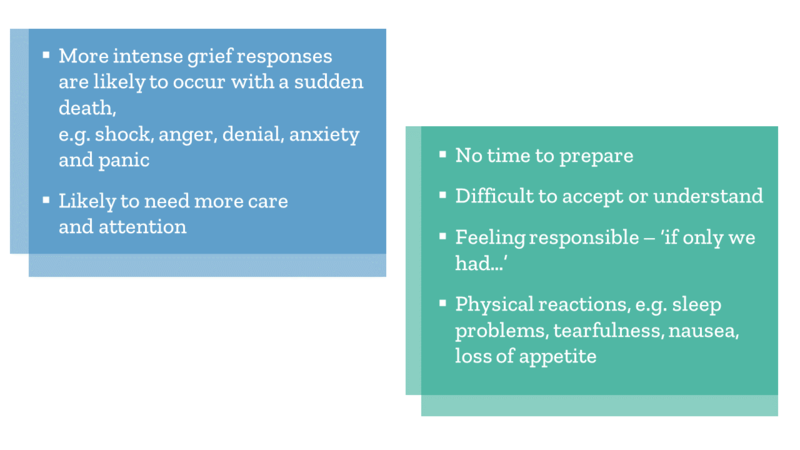 When someone we care about dies in a sudden, and/or traumatic situation the common grief reactions we are likely to experience can become more intense. Anticipatory grief occurs while someone is still alive but clearly dying. It is a common grief reaction for people who are facing the imminent death of someone they love or care for. It is also experienced by the person who is dying as they consider letting go of those they love, or are concerned about how loved ones will cope after their death. Anticipatory grief may not always occur. Nor does it make the grief reactions after death any shorter or less intense. In contrast to losing someone from a sudden or traumatic death, when it is known that a person is dying, there is the opportunity to resolve unfinished business, to spend quality time with them and for personal growth while the person is still alive. For some clients who are dying there are opportunities for the multi-agency team to plan their care with them, to try to ensure their wishes and concerns are known in the remaining time they have left. This can include reconnecting with family, or remaining at their project (with the right package of care) and managing any anxieties that arise. When caring for a client who is approaching the end of life it’s also important to share with others how you feel you are coping, particularly if you notice yourself struggling with the normal routines of daily life. You may cope fine, perhaps having a good supportive network or belief system to help you manage, but knowing there are additional supports you can make use of can be helpful. 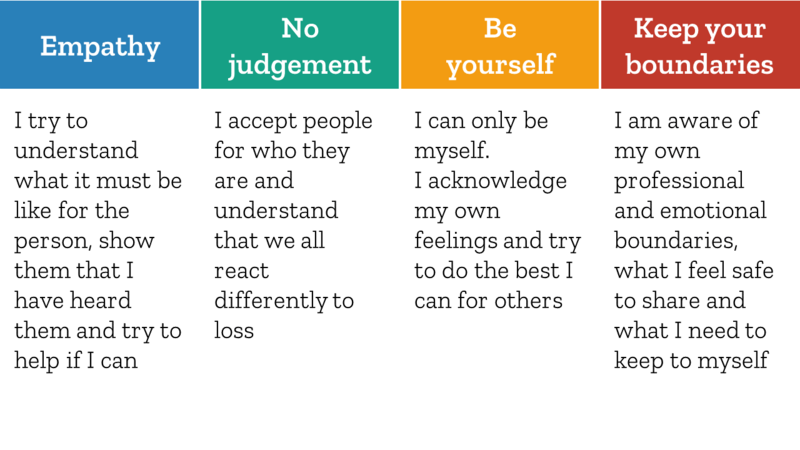 We have a developed a Self-care toolkit which you may find useful. Complicated grief is where the usual responses to the death do not fade over time and impair or prevent us leading our normal lives. Anger, irritation or episodes of rage. An inability to focus on anything but the death. Focusing intensely on reminders of the deceased, or an excessive avoidance of such reminders. Intense feelings of sadness, pain, detachment, sorrow, hopelessness, emptiness, low self-esteem, bitterness or longing for the deceased’s presence. Problems accepting the reality of the death. Self-destructive behaviour, such as alcohol or drug abuse. Considering many clients will have experienced multiple losses in their lives and/or have developed unhelpful coping strategies (such as using drugs and alcohol to block out strong grief reactions) they may be more vulnerable to complicated grief reactions. If you notice a client’s grief response remains the same or has intensified over time, discuss referral to the client’s local mental health team, or seek the advice of other specialists, such as counselling services or the Cruse Bereavement Care helpline. When someone we have loved or cared for dies, we are likely to experience many different types of emotional and physical reactions. We may feel these differently at different times in our grieving process. We are also likely to experience changes in our behaviour as we begin to adapt to our loss. Some people may feel some or all of the reactions below immediately, others may not experience them for some time. Moments of peace, or joy, or happiness are also normal during the grieving process. Shock and numbness – unable to believe what has happened. Physical sensations – Sleep problems, nausea, diarrhoea, loss of appetite, weight change, headaches, overall lack of energy, hyperactivity or underactivity, shortness of breath, feeling shaky, tearful. Anger – at what happened, at whoever allowed it to happen. Emotional reactions – Sadness, difficulty concentrating or focusing, fear, (e.g.fear of losing control), relief, irritability, longing, forgetfulness, slowed thinking, loneliness or isolation, feeling overly sensitive or dependent on others, lacking initiative, lacking interest in things we previously enjoyed, questioning our spiritual or religious beliefs, anxiety and panic. Behavioural changes – Distraction, searching for the deceased (e.g. revisiting familiar places), needing to retell our story of how they died, not expressing feelings in order to protect others (putting on a brave face), withdrawing from our normal / usual social interactions, avoiding others, excitement or euphoria – rushing around, busying ourselves with practical tasks. Denial of emotions – i.e. ‘I’m not angry’, I’m not upset’. For most of us our reactions will gradually fade without the need for professional intervention, even if they are difficult and intense in the immediate days and weeks following a loss. The lessening of these grief reactions does not mean that we are forgetting the person we have lost, but the reactions themselves subside. For some of us, additional support such as bereavement counselling may be helpful at some point in the grieving process. A small number of people are also likely to experience more severe grief reactions, (such as those found in complicated grief), that will require more formal support. While not every client requires formal bereavement support, there are many practical steps we can take to support clients, and help minimise the impact the death has on them and others, particularly in the hours, days and weeks following the death. Consider clients as much as possible in the practical arrangements following a death. Identify clients early on who may potentially be at risk, and consider if additional support is needed, perhaps from the community mental health team or your local bereavement service, (if available). Consider nominating staff members to ensure clients can access some 1-to-1 support as early as possible following a death (if not before). This could provide a space for clients, if they wanted too, to talk about how they are coping. Support may be as simple as ‘checking in’ with clients, or offering reassurance, that in itself will help reduce the impact of the loss. Where possible, try to ensure those closest to the client who has died are notified before informing others. This may include partners, family, friends, roommates and peers. Then, as best you can, gather everyone else together to inform them of the death. Announcing a death on a noticeboard, with no other discussion with clients should be seen as an absolute last resort. Let clients know as much as you can (or are allowed to) about the cause of death. Where an inquest is being carried out it is important to keep clients informed, confidentiality permitting, of what is happening, particularly if it is likely to take some time for the coroner to reach their conclusions. Let others know when the deceased’s belongings are going to be removed from their room, or when someone else is about to move in. Consider as a team how to acknowledge a client’s death. For instance, placing a memorial book and a photograph of them in a communal area of the project, once everyone has been notified. This may feel hard, but it can be the first of many ways to celebrate the life of the person. Involve clients as much as possible in any further commemorations, celebrations of life or any funeral arrangements. Support those who may not wish to attend by helping them consider other ways of celebrating or marking the client’s life. The after a client has died’ flowchart along with the other information in this section provide practical key points to consider after a death. Particular attention needs to be given to the period immediately following a sudden death at the project. This is where grief reactions can be most heightened. Some clients may be vulnerable to experiencing intense or prolonged grief reactions than others. Anticipating early on who may be at risk of difficulties in bereavement could help minimise the impact the death has had on them. It may also help you think ahead regarding any possible supports they may require should their grief reactions remain the same or escalate. Always liaise with the GP or mental health team if clients are presenting with more notable or complicated grief reactions. Also, clients may not necessarily need to have known, or have been close to the client who died for grief reactions to occur. Their death may simply act as a trigger for other major events and difficulties in their own lives. Sudden and traumatic death – particularly if clients were present at the time. Prior experience of multiple losses and childhood trauma – many of which may be unresolved. Difficulty expressing feelings about a loss, or multiple losses. Using unhelpful (but often necessary) coping strategies such as alcohol and drugs to mask grief. Poor supportive networks – making it more difficult to give meaning to their grief. Living with high support needs – usually a mix of physical and mental health problems, and substance misuse. Unable to engage with or fit in with local bereavement service structures. Knowing that there is no right way to grieve. Respecting their coping strategies and the choices they make, even when trying to encourage new ones. Supporting your local bereavement service to engage with you and clients. Look out for notable changes in clients following a death. Allow for the possibility that grief reactions may be intense or heightened in the coming hours and weeks following a death. For instance, increased levels of alcohol and substance use and/or heightened emotions such as shock, disbelief or anger. Honour and acknowledge clients’ experiences of the death. Support them to cope with their grief reactions, and bear in mind that grief reactions are normal and should gradually fade. If notable changes have not subsided in a few weeks, or you have significant concerns about a client, speak to their GP, and/or your local bereavement service for advice and support. Respect a client’s choice not to engage with services, but consider a multi-agency meeting. Together consider what you could offer the client that might help. Encourage clients to interact with others, or talk about their feelings. Continue to affirm and acknowledge the loss with clients months after a death, especially around significant events such as the clients first anniversary or their birthday for those closest to the client who died.. Consider that many clients will need their coping strategies and defences to deal with their loss, however much we wish them to be different. Acknowledge that while strong emotions, such as anger and guilt can be normal grief reactions following a death, when projected onto another person (e.g. a keyworker or another client) it can be challenging. In such situations, it’s helpful to recognize these reactions as a person’s way of expressing their own internal feelings around the death. Explore these reactions with them, and discuss more beneficial ways in which to respond to the way they are feeling. Different cultural and religious groups express and manage their grief in different ways. Even within the same groups there will be considerable variations depending on individual beliefs, practices and personalities. Our beliefs about the meaning of death may help us make sense of it, and cope with the mystery and fear surrounding dying. If you work with clients from different cultural and religious backgrounds, be aware of their beliefs and rituals associated with death. It’s important not to make assumptions. The support and information you provide should be sensitive to the individual needs of each client. The questions below might be helpful to support someone in their grief in a sensitive way. This list of the rituals and practices from several faiths, from when death approaches through to funeral customs and mourning practices will also be helpful. What emotions and behaviours are considered normal grief responses in that person’s culture? What are their beliefs surrounding death? Who is expected to attend mourning ceremonies, and how are attendees expected to dress and act? Are gifts, flowers or other offerings expected? What special days or dates will be significant to the client? What types of verbal or written condolences are considered appropriate? Consider how well your current organisational and procedural policies respond to a client’s death. How well does it consider the practical things that need to happen in the hours, days and weeks following the death. The bereavement support activity sheet could be helpful here. Familiarise yourself with how grief and bereavement can affect people in different ways. Leaving booklets about grief and loss around the project may provide opportunities for discussions. Your local bereavement service could help you here. Consider your own needs and qualities. It may be difficult for clients to engage with their loss. If a client is not ready or able to engage in discussions, you may need to accept that you have done the best you can at this time. Simply acknowledging their grief can be helpful. Other opportunities to engage may arise at another time. It’s not easy to know how best to respond to a client’s death. While being busy with practical things can be helpful or even comforting, finding time to work through your grief reactions, both as individuals and as a team is important and should not go unrecognized. As a team you need permission to grieve, to be able to show and express emotions, and to be able to take care of your own needs in a way that is appropriate to you. Perhaps you might think that expressing emotions is considered ‘unprofessional’ or a sign of weakness, or inappropriate, or that clients’ needs must come above your own. If this is the case, it is important to try and challenge this, as it may lead to feelings being suppressed and possible problems not being addressed. This may be particularly difficult if you were one of the first people on the scene following a sudden death. Coming to terms with the loss of a client may impact differently for each staff member, especially if they had a particular rapport with the client who died. This does not lessen the impact the loss will have for other staff, but due to this closer connection, the intensity may be greater. Many of you may also have experienced loss and bereavement in your personal lives. Some feelings related to this could re-emerge in response to a death at work. Acknowledge that you may feel overwhelmed at times by the intensity of your feelings, but that these feelings are likely to be part of a natural process of grieving, and will eventually fade. As emotions are unpredictable in bereavement, you might feel ok to be at work and then suddenly find yourself struggling to cope. Each team member needs to have the permission to assess what’s best for them and to do what’s necessary to take care of themselves. Find a good listener – reach out to others that you feel safe with. Talk openly and honestly to them about how you might be feeling. Consider seeking bereavement support if needed, particularly if following a number of weeks you become stuck with difficult emotions or reactions. Acknowledge that there may be more than one loss present. Honour and acknowledge the differences that arise within the team in response to a client’s death, and how these responses vary overtime. Consider the different kinds of rapport you and others have had with the client who died, and how a close connection might impact differently on how someone responds to the death of a client. Explore opportunities to express emotions and concerns as a team, and do whats necessary to take care of each other. Consider what is needed to support all members of the team, particularly in the initial days and weeks following a death. What actions might assist you and your team? Include opportunities for reflective practice, or counselling, and activities such as a shared meal. Bereavement support normally comes from community and hospital based bereavement services, some charities, palliative care teams or the client’s GP practice. It is usually provided by counsellors and/or trained bereavement volunteers. Discuss with your local bereavement service how they can support your clients. While many clients may not need formal bereavement support, as most grief reactions gradually fade, some may benefit from additional support. This is particularly the case for those clients who are struggling and find it difficult to engage with services. In such cases, flexibility and creativity may be required to make services more accessible to them. Consider also how your local bereavement service can support you. This may include exploring with them ways to support each other, or in feeling reassured, that as a team you are managing well. Direct 1-to-1 and group support for clients and staff. A counsellor attending client and team meetings to talk specifically about loss and grief. Signposting clients to more specialist services, if needed. Providing general and specialist advice and information booklets about grief and loss. Find out where your local bereavement service is. Cruse Bereavement Care has a list of national bereavement services (UK), a bereavement helpline and information about loss and bereavement. Consider inviting your local bereavement service to a team meeting to explore what they could offer to support you and your clients. This enables them to understand more about the clients you work with, and to talk specifically about loss and grief. Try gathering and displaying general information about loss and grief, and about the support your local bereavement service could provide (if available). This allows clients to access information any time they feel the need for it. Depending on where the death occurred, a medical certificate will be made available (in the hospital or through GP if death happened in the community) in order to register the death and proceed with funeral arrangements. Someone significant to the person (often a family member) registers the death with the local Register Office. Note the person who registers the death assumes responsibility for arranging the funeral, including it’s cost. Frontline staff should therefore not register a death without consulting their managers. The funds to pay for the funeral may either come from the estate of the person who has died or, if no money is available to pay for the funeral, and in the absence of family, a public health funeral may be their only option. Each local authority (or hospital if the individual died in hospital) assumes responsibility for public health funerals. These deaths will be referred to the local coroner for investigation before a death certificate can be issued and the body released for burial or cremation. Depending on the nature of the case, the coroner may hold an inquest. Staff may be contacted by the coroner to provide information to the court to help the coroner determine a verdict and cause of death. See more information here. Once the coroner releases the body, funeral arrangements can be made. In situations where clients require some financial assistance, for example, to attend a funeral, there may be very little outside of any financial support you as a project might provide. There may be possible grants and other financial assistance worth applying for, though may take time, or a client may not meet the criteria. For things like a client wanting more appropriate clothing to attend a funeral, it’s possible that a local charity shop will support you. If your project experiences multiple deaths it may be worth considering setting up a fund to cover the costs involved in clients being able to attend funerals. Local charities or fundraisers may support you here. In situations where a clients next of kin or family are seeking advice and support following the death of a client, the following information may be of help to them. As funerals are expensive, it can be helpful to know what budget a person or family is working to, and that there are ways of keeping costs down when budgets are tight. Some people may be entitled to additional benefits, such as the Bereavement Support Payment for a spouse or civil partner, or the Social Fund Funeral Expenses Payment, an income related benefit. There are also charities who can assist with funeral expenses. Some are benevolent funds linked to the type of work someone is doing or has done in the past, and others are local or more general charities. A good place to start is the Turn2Us grant search, or by doing a simple internet search using keywords. Be aware however that charities and the Social Fund often take several weeks to make a decision. For more detailed information this simple and practical guide to planning an affordable and meaningful funeral will help. Developed by Quaker Social Action, their service, Down to Earth also provides telephone based advice to people who need to arrange a funeral, and an online tool addressing how to reduce funeral-related debt in a step-by-step way. For those struggling to come to terms with their loss you can encourage them to contact their local GP service, or their local bereavement service. Cruse bereavement care can provide information about coping with grief and loss, and how to get in touch with their local bereavement service. Where a child or teenager has been affected by the death Winstons wish can provide information and support to them. A client may choose to tell someone about how they would wish to be remembered after their death. Knowing how a client would like to be remembered and the kind of funeral they would like can make everyone feel part of something special that the client has put together. The communicating about what matters to clients section may help you and a client consider possibilities for recording their wishes prior to their death. This form by the Quaker Social Action may also help. However, for many clients this opportunity may not present itself, particularly if their death was sudden and unexpected. Decisions may have to be made about the type of funeral they might have wished for. In the absence of family or funds to cover the cost of a funeral, a public health funeral will be the most likely option. When a client dies in hospital and there is no next of kin or money to pay for the funeral, the hospital assumes responsibility. If the death occurred outside of hospital, the local authority within which the client resides will assume responsibility. The hospital or local authority need to establish whether there are funds, either from the client’s estate, or from family members, to contribute to funeral costs, and if not to begin making arrangements for a public health funeral. Arrangements will vary from area to area, but normally there is an arrangement between the hospital or local authority and a local funeral undertaker. The service is basic, but can include a celebrant-led service, which anyone can attend. Public health funerals are very basic and the burial or cremation times are normally the least popular, like early morning, which might make it difficult for some clients to attend. Contact the department within the Patient Advice and Liaison Service (PALS) section of the hospital or your local authority (as they vary) early following the death of a client. Try to get a contact name, and let them know about where the client was living. Inform them of the relationship between the client, you, the project and other clients, particularly if the client saw the project as their home and/or staff as next of kin. This helps them understand the significance of the relationship you all had with the deceased. Find out how you can be notified of the time and date of the funeral, and let the hospital or local authority know that you and potentially other clients would like to attend. If a client made a verbal or written wish to be buried or cremated, let the service arranging the funeral know. This will normally be honoured, and where it is unknown, the type of burial or cremation that is carried out will vary in different hospitals and local authorities. It’s always helpful to have a good rapport with these services, particularly if your project has experienced numerous deaths. Otherwise it can be difficult to know when a client may be buried or cremated, and opportunities to attend the funeral may be missed. Where a postmortem is carried out, contact the coroner’s office to find out when the client’s body is being released to the hospital/local authority for burial or cremation. This is often where opportunities are missed to attend or participate in a funeral. Ask if they could notify you, or keep checking with them. If a client had a particular faith, or may have preferred a non-religious service, let the hospital or local authority know. Though services are likely to be short, they can help to honour a client’s life. Encourage clients and others who knew the client to attend. For those unable to attend, try to arrange a celebration at the project. Alongside funerals, there are many different rituals and celebrations to consider that could reflect the nature and personality of the client who has died, and that could be a good opportunity for everyone to come together and remember the client and show their respects for the client’s life. This is particularly important in situations where it has not been possible to know the expressed wishes of a client, or where there is no opportunity to attend or plan their funeral. You could ask your local bereavement service to support you in this. Celebrations may also be an opportunity to consider how other clients might perceive their own mortality, and those who may wish to discuss their own preferences for after they die. The communicating about what matters to clients section provides tools and information to help you make the most of any spontaneous conversations that may come up. A celebration of life service – it can be religious, non-religious or humanistic, and held at the project or in the community. An initiative from Brake, a road safety charity, supporting people who are bereaved following a sudden death. Survivors of bereavement by suicide – a national helpline and network of support groups, and other resources for those bereaved by suicide.